We believe that this is done best in the context of vital relationships, first with Him, then with each other, and with our community. We are a growing church family in your community and would love to serve you in any way possible. 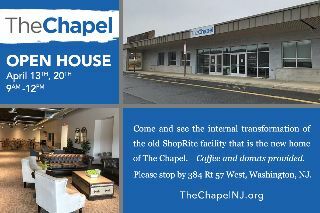 This is an informal opportunity for people to see the internal transformation of the old ShopRite building to The Chapel. We would encourage you to blast this invitation to your Facebook and other social media followers and friends. Final rehearsal This Saturday, April 20th. Contact Sandi Wagner at 908-235-6009. Please plan to attend one of the services, and invite a friend! For Christians who want to get a good foundation in the basics, this study is a complete, self-contained study on the Christian faith. For Christians who want to go deeper, each lesson compliments a chapter of Michael Horton’s book Core Christianity: Finding yourself in God’s Story. This is a 10-week class on Wednesdays, April 24th - June 26th from 7:00-8:30 PM at The Chapel. Signup sheet on the table in the foyer. See Joe Depinto. Core Christianity exists to engage the world with the gospel of Jesus Christ. We believe the core message of Christianity is still capable of renewing the church. Please join us on Thursday, April 25th at 7:00 PM at The Chapel to hear a first-hand account of what is involved in organ donation. Rudy DiGilio, a representative from the New Jersey Sharing Network, and an organ donor will be the guest speaker. Thursday, May 2nd at 12:00 PM, at the chapel. Anyone of any age is welcome! Enjoy good food, engage in good fellowship, and build vital relationships! Signup sheet on the table in the foyer. See Ruth Hoff or Kathy Halpin for details. Washington Alliance Church (2112 Route 57). The keynote speaker will be Tammy Trent. She is a gifted communicator who draws her audience close with her contagious humor and fun, energetic personality and yet the sincerity of her heart and wisdom of life experience is woven through the very words she speaks. Tammy says, “One of my greatest privileges on this journey of hope and healing is to be able to speak into someone’s life who feels hopeless and numb. I’ve been there too, and one thing I’ve learned is that we can never interpret our numbness as God’s absence in our lives”. The Hoving Home president, Beth Greco, will also be sharing about the exciting things that have taken place over the last 52 years. Also, hear the Ladies of the Hoving Home choir in song and testimony. Please call 845-424-3674 for any questions or email whhny@hovinghome.org. The Hoving Home is a Christ-centered ministry for ladies who have been involved in drug-addiction, alcoholism, and other serious life-controlling problems. Hope in the Hills "Weekend of Hope"
Hope in the Hills Weekend of Hope assists elderly, low-income and/or disabled homeowners with minor repairs to their homes. There is an urgent need for volunteers, aged 14 yrs. old and up, in order to make this a successful outreach. No experience necessary. The event is scheduled for June 21st – 24th, which includes an orientation, with dinner, on Friday evening. Registration forms are at the sign up table in the foyer or online. Hope in the Hills of Warren is a community extension of Warren County Habitat for Humanity. Contact Fran Pilch or Donna Detrick. If you would like to be baptized as an outward sign of your faith in Jesus Christ, please sign up in the foyer. Please see one of the Pastors if you have any questions. We are very excited to announce our speaker for this year is our dear sister Peg Horton, Missionary to China! The theme is "Be Different in a Difficult World". Cost is $100.00 per person. Full payment is due no later than May 31. After this time we will open up the retreat to Hoving Home ladies. Registration is only online. If you need help with online registration see the lady at our table before or after church. PLEASE NOTE: SIGNING THE SIGNUP SHEET AT CHURCH DOES NOT GUARANTEE A SPOT! ONLY REGISTERING AND PAYING ONLINE BY MAY 31 DOES! We will have a meeting after church right before the retreat to answer questions and give further instructions.